Opening my sample package of Angel’s Envy Bourbon brought a question to mind. What do angels envy? I’m not talking Hell’s Angels, Charlie’s Angels or even Archangels, I’m talking the angel’s share angels. Every barrel of spirits loses volume over its years of aging. That loss is called the angel’s share. So, here’s where the question gets harder. If the angels get a share of EVERY bourbon aging what would be left for them to envy at all? The answer, I decided, was much easier than I expected. The angels envy what’s left in the barrels. 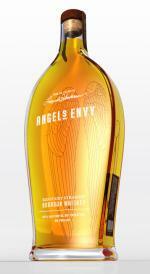 In the case of Angel’s Envy Bourbon they have a lot to be envious about. Lincoln Henderson, Master Distiller for Louisville Distilling Company and former Master Distiller for Brown-Forman, starts with Kentucky straight bourbon aged 4-6 years in American white oak barrels. From there the spirit is transferred to port casks for a final 3-6 month aging. Lincoln then personally samples each batch prior to bottling to make sure each one meets the Angel’s Envy standard. The result of all this hard work is a tremendous bourbon. The color is darker amber with a slight rosiness, no doubt a result of the port cask aging. The aroma is clean with vanilla and hints of the port coming through very lightly. There is a tantalizing complexity in the aroma that makes you want to start sipping right away. The flavor definitely lives up to the aroma. Flavors of vanilla, Christmas spices (you know the ones), and a deep fruitiness run throughout. There is a lot of depth of flavor here and you get to enjoy it for a while. The finish is nice and long with the vanilla wrapping up the experience. My explanation of what angels envy may be a load of bull but I can tell you one thing for sure. I envy the man who has the full bottle of Angel’s Envy. I miss mine already.